Corte Madera is just 15 minutes north of San Francisco. The area is historically famous for producing lumber out of redwood trees which went into the construction of the city of San Francisco. 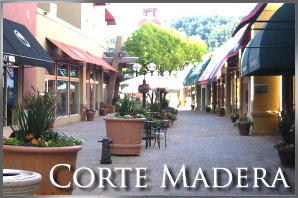 Corte Madera features two of Marin’s wonderful, upscale shopping plazas known as: The Village at Corte Madera and Town Center at Corte Madera. The Old Corte Madera Town Square, surrounding Piccolo Pavilion, is home to the historic buildings as well as local shops including hair salons, consignment stores, arts classrooms, and Swedish textile products. Nestled in between San Rafael and Mill Valley, Corte Madera harbors some of Marin’s most picturesque neighborhoods.